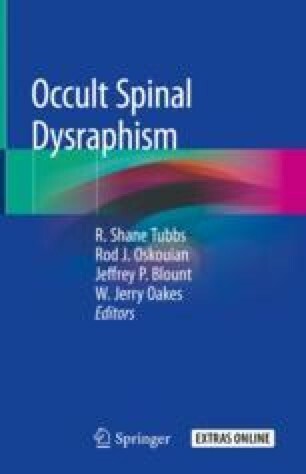 Imaging of occult spinal dysraphism (OSD) has evolved significantly over the recent years. The preferred imaging modality of choice for most, if not all, lesions is MRI. In this chapter, we review imaging of five clinically relevant OSDs: low conus medullaris, dermal sinus tract, lipomyelomeningocele, neurenteric cyst, and split cord malformation. In each section, we take the opportunity to explore related topics. In the first section, the topics of nondiagnostic imaging in tethered cord syndrome, incidental fatty fila, and evaluation of the sacral dimple are discussed. The next section, on dermal sinus tracts, includes a discussion about related diagnoses, including the newer diagnostic entity of limited dorsal myeloschisis (LMD) and the more historical meningocele manqué (MM). A third section discusses the imaging characteristics of lipomyelomeningocele, with a subsection on related diagnoses such as meningocele and myelocele. After discussions about neurenteric cysts (NECs) and split cord malformations (SCMs), we discuss future directions for imaging of OSD.